It's been a busy week, or as busy as it can be for a city where embassies and government ministries are only open for 3-4 hours a day, and some only 3 days a week. Plus the town layout, in the shape of the Union Jack thanks to the colonizing Brits, while perhaps looking nice on a map is not the most practical of designs for a present day capital city. Most roads are one-way streets and as many as six of these will converge on each other in certain spots on the flag's design with disastrous consequences: huge bottle necks of traffic that sit jammed to a standstill in the heat. Some streets are open to pedestrians and cyclists, but not to cars or trucks, while some are open to cars but not to cyclists. I had one armed guard run after me down one street opposite the Republican Palace threatening to shoot me unless I turned back. Apparently the last guy (a local Sudanese) who rode a bicycle on the same street had been carrying a chicken that promptly escaped into the palace and it took the entire palace guard several hours to catch. The sight of anyone riding a bicycle since seems to trigger instant hysteria of the possibility of another chicken invasion. As far as getting closer to gaining permission to cross this wretched lake, the picture is definitely getting clearer as to the ins and outs of what is going to be possible, but I'm not sure I'm any closer to being able to do it. The Egyptian side is proving to be the most difficult as anticipated: all expeditions that have tried to cross the lake in recent years have been turned back; the last being a National Geographic film crew. Nonetheless I have sent off a formal request to the powers that be in Cairo via the Egyptian Embassy here, and in the slim chance that they say yes, the Sudanese Ministry of Tourism have said they would then grant permission from the Sudan side. So I'm going to start biking north towards Wadi Halfa on Sunday morning, and in the 12-14 days that it will take me to get there, hopefully word will come back from Cairo as to the options. But backtracking all the way to India is still a very real possibility. 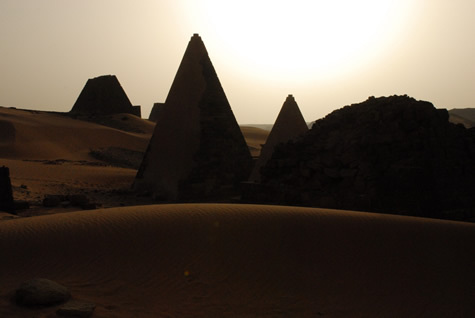 In amongst all this bureaucratic nonsense I was able to do a side trip to the ancient pyramids at Meroe, thanks to some friends from the International School who were heading out there anyway. 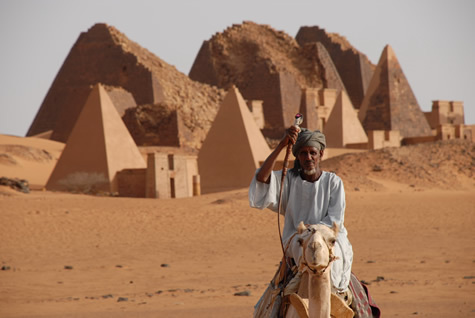 The amazing thing about archeological sites in the Sudan is that they are almost unknown by comparison to their infamous cousins across the border in Egypt. While the latter are protected by glass panels and cost a fortune to get in to see, not to mention the hundreds of fellow tourists you have to elbow out of the way just to catch a glimpse, the sites in Sudan are often deserted, with the result that you have the rare sensation of discovering history for the first time, almost Indiana Jones-like. 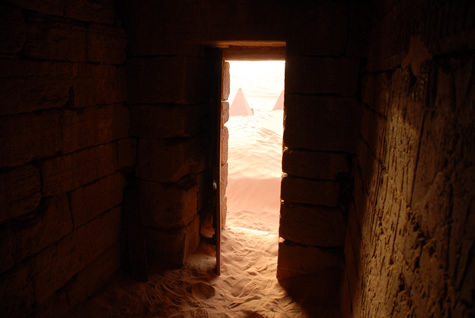 The tombs at Meroe were built in the 8th century BC for the Kushite Kings that ruled the region from around the 25th dynasty in Egypt. Although clearly Egyptian in inspiration, they differ markedly from the pyramids at Giza: they are smaller (the highest being 30m), the angles are much more acute (approaching 70 degrees) and the tomb chambers were dug directly into the rock below and the pyramid built on top. 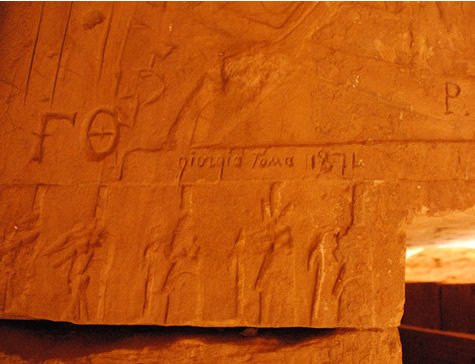 Many of the chambers were visited by early explorers who left graffiti of their own name and a date. 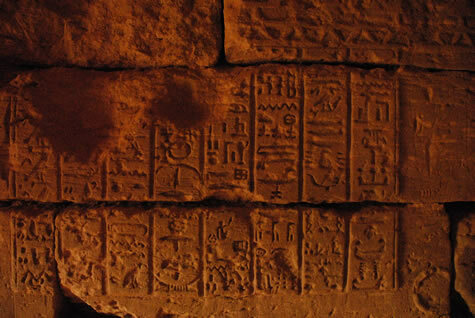 They continued a long tradition of vandalism started by successive royal benefactors who would replace the names of their predecessors inscribed in the rock hieroglyphics with their own. And somehow the passage of time lends value even to these 19th century additions. Almost all of the pyramids were decapitated in 1834 thanks to an Italian tomb robber, Guiseppe Ferlini, who was convinced they held great riches. Unfortunately he struck gold on his first attempt: in the pyramid of Queen Amanishakheto he found a hoard of gold jewelry in a chamber near the tomb's apex. This inspired, he proceeded to tear the tops off most of the others, but without finding anything else. 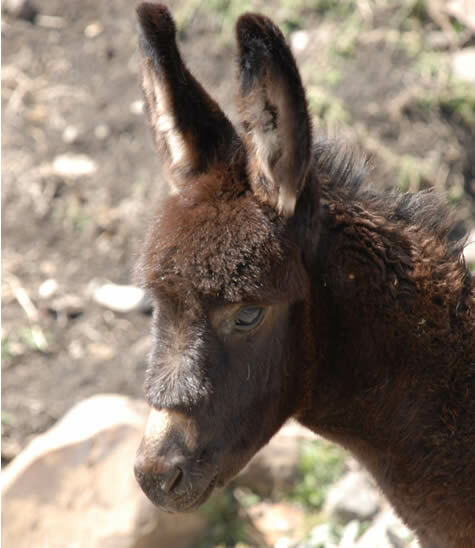 A word of thanks to recent contributors to the Moksha Shipping drive. There's just another $1,000 to raise and then we're there! I've reached Khartoum, best known in historical terms perhaps for the last stand of Victorian icon Gordan, whose small defending force was overrun by the Madhist rebellion in 1884/5. Any romantic image of the city associated with this classic event however is quickly done away with by arriving in the grim reality of the modern day version: like most capital cities; noisy, congested and polluted. After recovering from food poisoning (quickly once on antibiotics) I made decent progress riding the 400+ kms from Gedaref: flat-going for the most part on asphalt, but rather boring; the highlight of each day being a bend in the road. 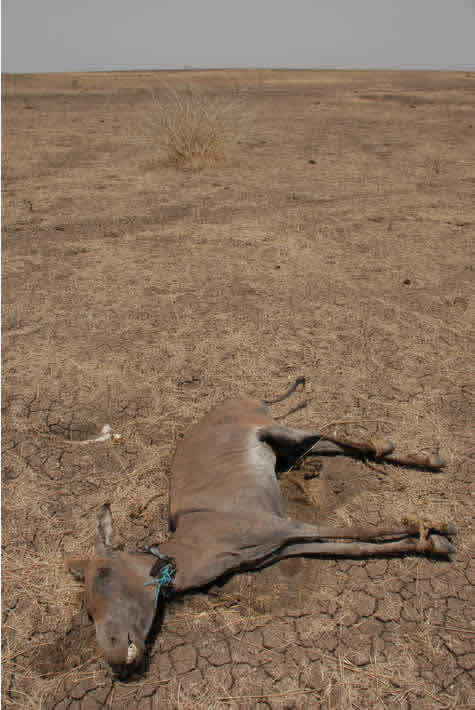 Although dry and parched at this time of year the landscape will alter dramatically in a few weeks to lush green when the rains start. 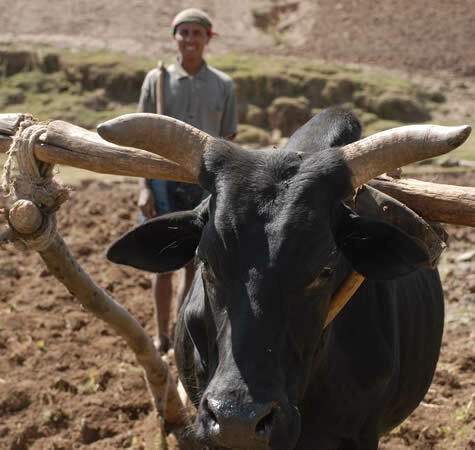 This is the breadbasket region of Sudan between the White and Blue Niles where dark, fertile soils provide the ideal growing conditions for cotton, sorghum and sesame. A vast irrigation project called the Gezira Project was started by the British in the early part of the 19th century which revolutionized land use in Sudan: eradicating absentee land lords and allowing tenant farmers free irrigation water in return for the State taking a share of the profits. A light railway crisscrossing the area allowed quick access to markets. The Sudanese people have been universally friendly and hospitable, offering help and general good will all along the way. I think they must be the friendliest bunch since Malaysia. More than once I've had my meal paid for by a stranger without knowing about it until after they've left the restaurant/roadside cafe and it's sadly too late to even thank them. But I'm learning that modesty is also a common personality trait of these people. One evening when a dust storm blew in just before dark the owner of the cafe I was taking refuge in didn't even need to be asked it I could stay the night there; a string bed was automatically magicked out of nowhere and I was able to sleep undisturbed behind the restaurant, my bike and gear locked safely in the storeroom. 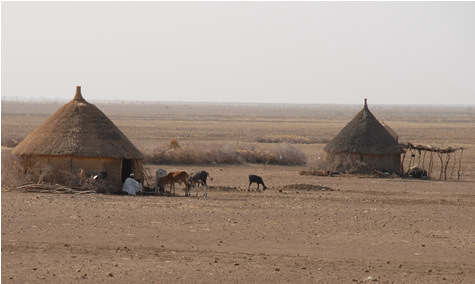 Which I probably didn't even need to do - Sudan, or at least this region of it, being quite safe from thievery (contrary to what one might believe after reading the on-going humanitarian disaster in Darfur). For myself I have never once felt threatened, so I have been able to hide the Khukri knife away out of view so as not to cause offense. And in Gedaref I left my bike outside the main entrance to the hospital for well over an hour without anyone even touching it. 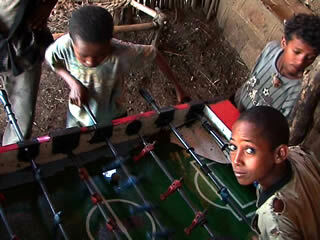 I doubt this is something I will be able to do in any other country after I leave the Sudan heading north. It's great not to feel stressed by agro with the locals. In other countries, like Ethiopia and Indonesia, I've found myself becoming increasingly irritated the longer I am in the country. But in the Sudan this hasn't been a problem at all. 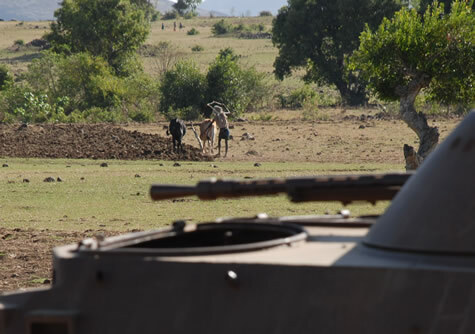 Still, it's proving hard to reconcile the two very different pictures of Sudan that have in my mind: the gun-toting, civil-war torn one that I entered the country with and the generous, peaceful one that I have experienced at first hand. However nice towards strangers they still treat their animals dreadfully like in most developing countries (see today's vlog). My preoccupation with water is steadily increasingly with the rise in daily temperatures (never less than 45 degrees now after 11a.m. 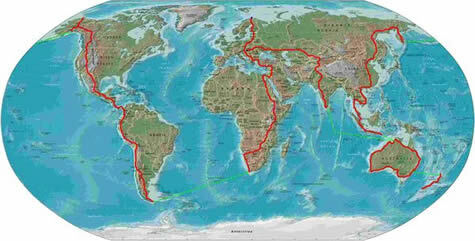 ), and the prospect of heading north into really hard country on this next stretch to the Egyptian border. 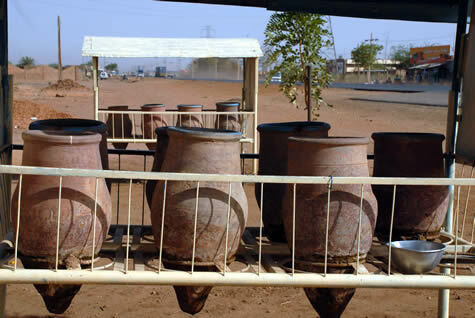 The one saving grace are the clay pots they keep by the side of the road at regular intervals for people to grab a cupful as they pass by. Being porous they allow a slow process of evapouration from the sides and bottom of the pot and the heat exchange in turn keeps the water cool - very simple but quite ingenious! 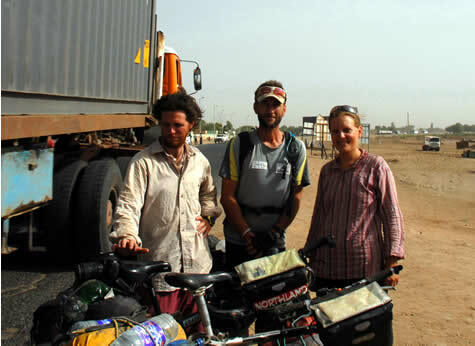 over the next 4-5 years, Philipp and Valeska from Austria are on the first leg of their multi-year odyssey. We sat drinking tea for an hour or so, exchanging notes on our respective routes, sharing valuable tips and information on the road ahead for the other rider/s. 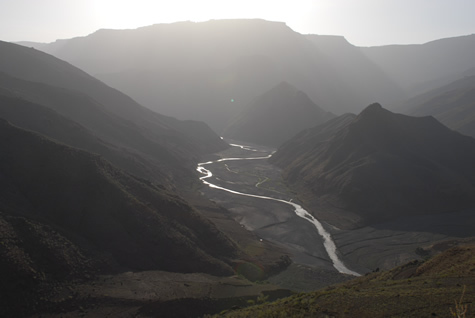 After the rather grim picture painted by the overland team that I met in Gondar before leaving Ethiopia, hearing a more positive version, and from fellow cyclists, has helped me to regain confidence that it will be possible to reach Wadi Halfa unsupported and alone. Although I will certainly be shedding a lot of gear in place of water, and I can apparently expect the same headwind that I've been pedaling against from Gallabat to continue all the way up into Syria. Two hours ago I was discharged from the hospital here in Gedaref (rather I released myself in the interests of health - not being the most hygienic medical facility on the planet!). Joking aside I have much to thank them for. Having a laboratory on site they were able to diagnose the real substance of my complaint: severe food poisoning, which in turn was leading to dehydration. And the whole process from walking in the door, to consultation with a Doc. (who spoke a little English), to the lab processing, to diagnosis and taking the first round of antibiotics; all within 30 minutes! You'd be dreaming to expect such service from the National Health Service in the UK or even a private healthcare facility in the US. The day did not start out quite as well however. 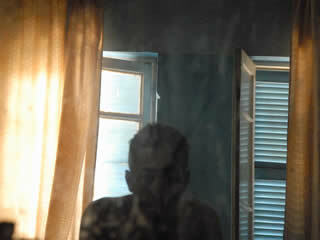 I knew there was something more afoot than just dehydration from heat after I awoke on this 5th morning still with chronic diarrhea, periodic vomiting and general malaise. The distance from Gallabat to Gedaref is only 156 kms but it has taken three days of slog against a crushing headwind that has kept my speed under 10 kmph the entire way: a snail's pace even given the heat and sickness. My daily routine has already adapted to that which I used throughout the Central American leg in 1997: hiding from the sun in the flood tunnels under the road after midday to late afternoon; then biking till dark; sleeping in another tunnel till 5 am; then riding until noon, by which time the temperature has soared to the point that I have to wear gloves to even touch my bike frame without getting burnt. These tunnels not only provide shade during the day, but also a safe haven to sleep undetected from the locals at night (someone has to be looking straight down the length of the tunnel to actually see me): better than pitching a tent out in the open where I'm free game to hordes of inquisitive children or opportunistic chancers with less than admirable intentions. One time of year these tunnels are not to be recommended however is during the rainy season, for obvious reasons! 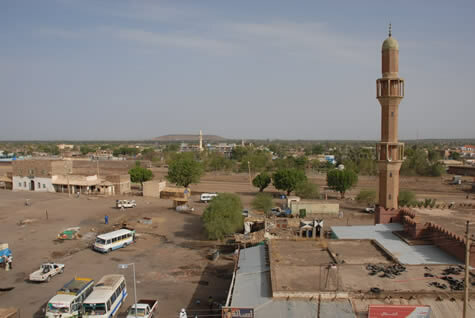 When I finally arrived in Gedaref late this morning I was immediately flagged down by the local police and ordered to register with the 'Passport Police': something every 'Khawaja' (foreigner) has to do within 3-days of entering Sudan. This involved a 20-minute wild goose chase across town, only to be sent back in the opposite direction (upon arrival at the correct police station) to find the 'Sudan-French' bank that could change my Ethiopian Birr into Sudanese Dinar so I could pay the $66 (US) registration fee. The exchange clerk behind the counter at the Sudan-French bank looked at my Ethiopian currency like I was holding a turd, and with a sweeping gesture of his right hand that encompassed most of northern Sudan sent me off in search of a money changer called 'Mohammed El Git', or at least that's what it sounded like to my ignorant ear. I must have asked half of Gedaref where this 'El Git' was, even in the 'souq' (market place), where the noise, confusion and stomach-wrenching images of animal body parts carpeted with black flies and smelling like three-week old camel's toe-jam finally put me over the edge: I lost total sphincter control and there wasn't a damn thing I could do about it. The temperature was now touching 47 degrees. When I finally found him, 'El Git' turned out to be a very kind and courteous man, giving me a decent rate for my Birr and buying me a bottle of chilled water - the most heavenly thing I'd tasted in a long time. Sensing (and smelling) that all was not well with my condition, he gave me precise directions back to the Passport Police who, upon my dramatic-smelling entrance, processed my registration in double quick time just to get me out of their office. Finally I was free to wobble off in search of the hospital, something which I really wasn't expecting to find until Khartoum, reflecting on how traveling with a partner can sometimes have real advantages. I hope to have better images and descriptions of the surroundings when I'm well enough to continue and in a better state to absorb what I know will be a fascinating country to travel through: a vast land of contrasts boasting desert caravans, lush river valleys, over 100 languages spoken by 20 major tribes and more pyramids than Egypt. Stay tuned. Overcast conditions and light rain followed me on the way out of Gondar, enough to feel a slight chill on the first part of the descent from the Ethiopian Highlands to Azezo where the asphalt came to an abrupt halt. 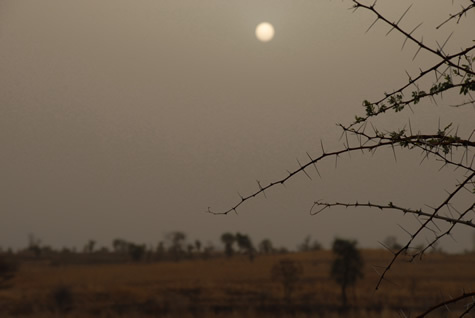 For the next 200 kms to the Sudan border at Metema the altitude continued to drop, the road quickly deteriorating to a rutted gravel track and the heat really started to kick in. The cool temperatures that I enjoyed riding across the Highlands are now only distant memory. 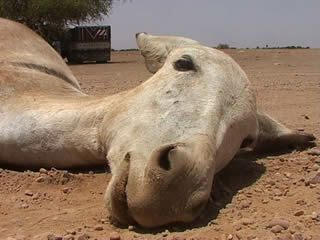 From now on it will be desert and scorching summer temperatures all the way to Europe. It was with some trepidation therefore that I left the high plateau: partly because of the prospect of 50+ degree heat the further north I reach, but also because of learning of a first hand report of the dreadful road conditions on the north section of Sudan between Dongola and Wadi Halfa (on the border with Egypt) from a party of overlanders traveling in convoy by 4WD vehicles and motorcycles. I knew this section was going to be tough, but from what they had to say I doubt if it will even be possible without ditching a significant amount of my gear in place of the 7-10L of water I'll need per day, much of it spent pushing my bike through sand. Added to these factors is the uncertainty over whether I will be able to get permits to paddle across Lake Nasser. Getting permission from the Egyptians rather than the Sudanese will be the hardest part by the sound of it, and at present I don't have any leverage with the Egyptian authorities whatsoever. Not from lack of trying I might add - but doing a unique expedition like this doesn't seem to yield any extra curricular assistance from the British government these days. This is not a new phenomenon. Back in 2005 we got more help from the Americans in East Timor to get our kayaks across the border into Indonesia than the Brits, and only one of our party was American! Anyway, I'm writing this in the safety of the Sudanese Customs compound over the border in Gallabat, just a stone's throw across the border from Ethiopia. These past couple of days I've been suffering from increased nausea and fatigue, most likely from the heat and struggling with the barely rideable road. This morning after crossing over the border (with no problem) I felt unable to continue for the day, and upon making enquiries learnt that the next hotel was 155 kms away in Gedaref, unless I backtracked to the Ethiopian side where there was one just 300 yards away! But I already had my passport stamped, so this was impossible. Thankfully my local fixer 'David', who I employed for 20 birr ($2.50 US) to run me through all of the bureaucratic hoops both sides of the border, had a word with the Customs officials and I was offered to crash out on a string bed under a large shade tree at the back of their office building - my first experience of the legendary Sudanese hospitality that I've read and heard so much about. So the day has been largely spent horizontal, drinking as much water mixed with oral re-hydration salts that I can cram down my neck, and swatting at the clouds of flies that come in abundance with every African village. I'm hoping this is the only thing that is wrong with me. I think it's a safe bet as I've drunk 10 litres today already and haven't peed once. Hopefully my strength (and appetite - not having eaten anything in 48hrs) will return tomorrow for the much anticipated introductory ride into the Land of Kush. Sudan Visa at last - GREAT SUCCESS!! After a month of waiting I finally walked away from the Sudanese consulate yesterday afternoon with the needful visa in hand. 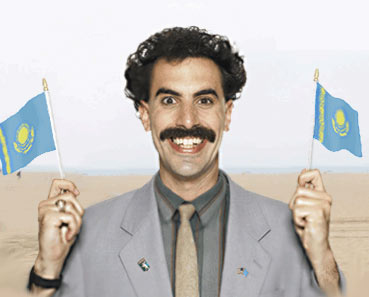 In the words of Borat - "GREAT SUCCESS!!!" 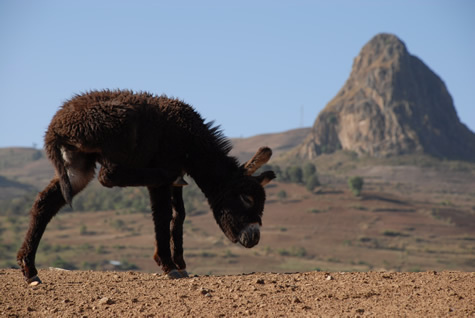 Today I return to Gondar and high tail it for the Sudan border only 200kms away. At the time of issue the 30-day visa also comes into effect, so I'm on the clock to make best use of it: this next section is I believe the last major hurdle to getting back to Greenwich in October. If I can swing a permit to paddle across Lake Nasser to Egypt then it's a relatively straightforward pedal back through the Middle East and Europe to finish. If I can't get a permit it could mean backtracking all the way to Mumbai in India! 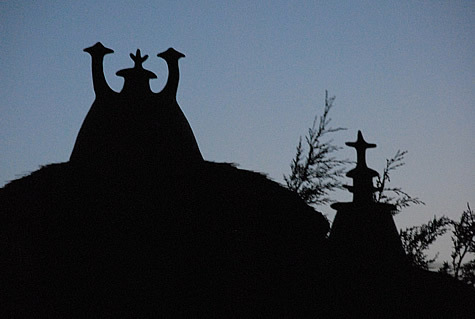 The hilltop town of Gondar is further testament to Ethiopia's rich cultural and religious past. Walking around the ruins of the medieval castles and churches that were built here in the 17th century I felt I could quite easily have been back in England or Scotland. 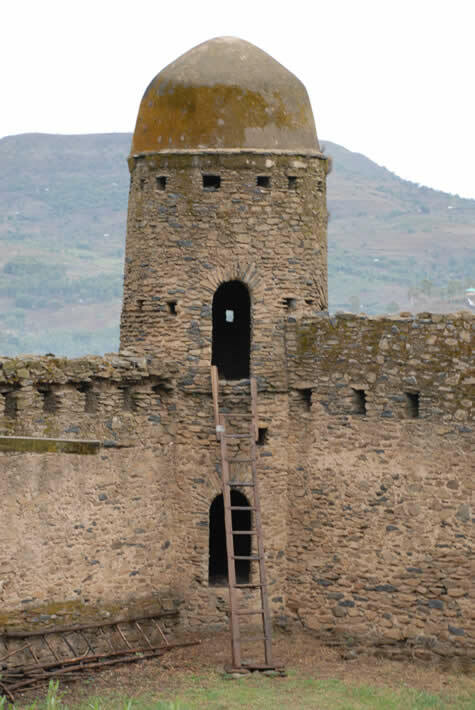 It's not hard to understand why some have labeled Gondar as Ethiopia's Camelot. A rendition of Macbeth could be staged here without it looking at all out of place. 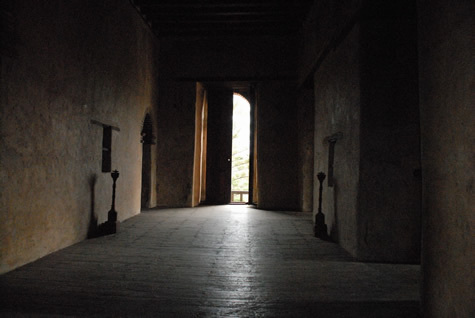 Gondar was established as Ethiopia's first permanent capital by King Fasilidas in the 1630's. Prior to this the nation's capitals were little more than royal tented camps, always on the move around the realm with a vast entourage of family, soldiers and general hangers-on who consumed everything in their path like a swarm of locusts. The reason for these transient capitals was to keep a firm grip over the country and preempt rebellions from outlying tribes. It is still under debate by historians whether these castles were designed by Indians, Portuguese or Arabs. Probably a mixture with local Axumite influence thrown in. At the height of it's power and glory these banquets halls would have been filled with elaborate decorations for the sumptuous feasts laid on by the various Kings and Emperors who reined throughout this golden era. 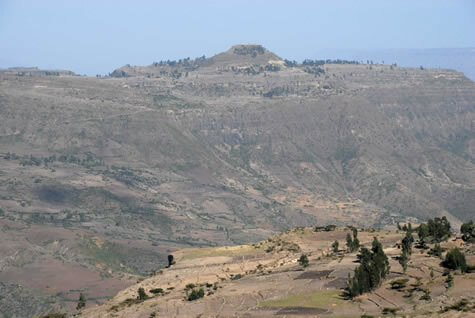 In 1855 King Tewedros II moved the capital to Maquedala, the hilltop fortress that was eventually destroyed by the British in 1867 (see past update). Before arriving in Ethiopia I was one of those ignorant people who still associated the country with famine, war and desperate images of people close to starvation and small children with swollen stomachs wandering in amongst sacks of food aid. 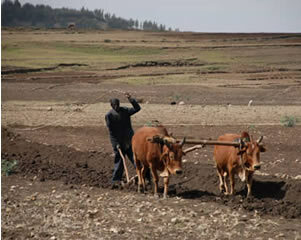 In the 1980's this was all we seemed to see of Ethiopia on our TV screens in the west. What I didn't realize then, but do now, is just how rich the cultural and religious history of this country is. Sometimes its hard for me to reconcile the two profiles: the glory days of old with the modern version containing so much poverty, misery and suffering. Did you know for example that one of the lost tribes of Israel ended up here, leading to over 14,000 'Falasha', or Black Jews, being airlifted to Israel in the 1977 'Operation Solomon'? Also Christianity reached Ethiopian well before Europe, leading to one of the world's several branches of Orthodox Christianity being established here with now over 40 million members. And St. George (as in dragon slayer) is one of the most important patron saints of the country. 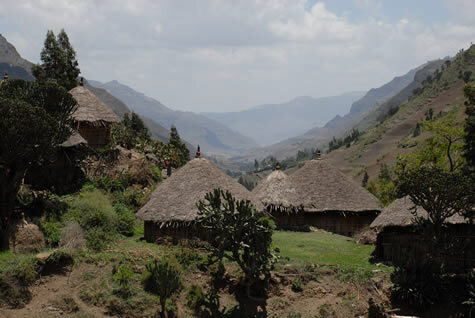 The north Ethiopian city of Aksum was once home to the Queen of Sheba, who reputedly visited King Solomon to discuss trade and seek out his wisdom. 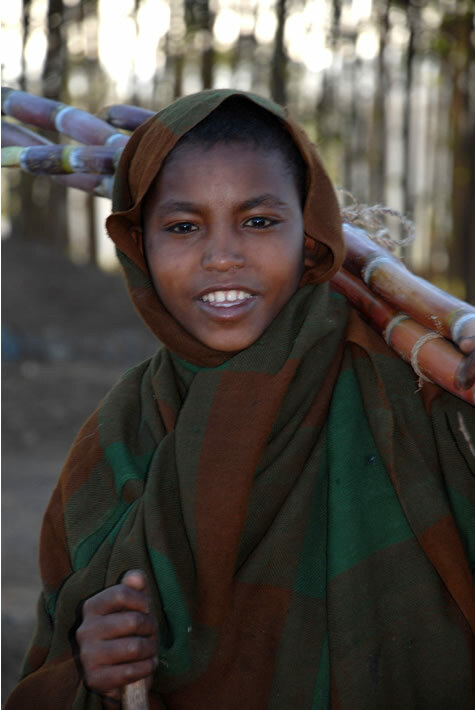 Legend has it that she returned to Ethiopia carrying Solomon's child, born as Menelik, the first King of Ethiopia. 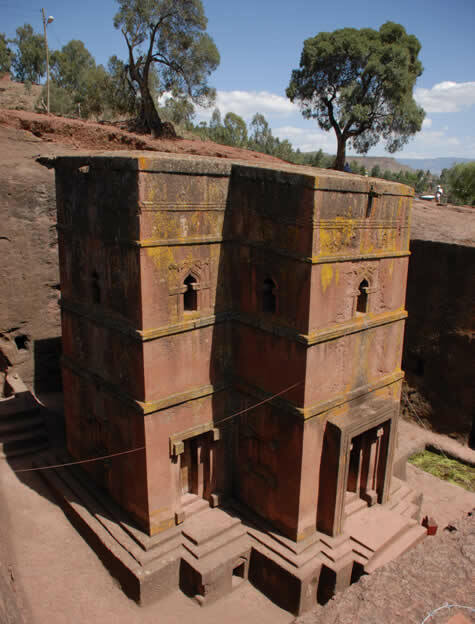 And according to Ethiopian tradition, the Ark of the Covenant was brought to Aksum and still resides there today in the Chapel of the Tablet, protected by a single, lifelong guardian who is the only living human being allowed to view it. Heady stuff! 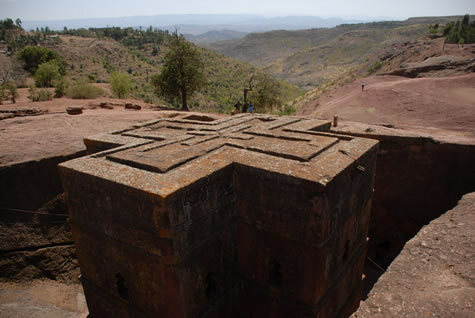 One legend that has rock solid evidence today are the rock hewn churches at the tiny town of Lalibela, offering me the excuse for a side trip to take in what has been described by some as the 8th wonder of the world. 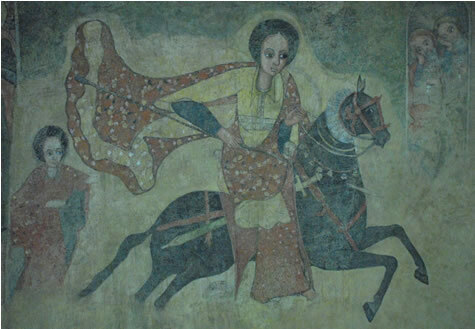 The story goes that King Lalibela visited Jerusalem in the late 12th century and upon his return decided to build a new Jerusalem as a response to Muslims capturing the old one in 1187. The result today is 13 churches built either out of the solid rock as monolithic structures or as cave structures which are cut inwards from a more or less vertical cliff face, often utilizing an existing cave as a start point. They instantly reminded me of the rock hewn temples at the Ellora Caves that I visited north of Mumbai in India last year. Completed just 200 years before the churches at Lalibela, one can't help but wonder if there was some connection between the two in terms of the inspiration for the way they were formed: below ground level in both cases to avoid detection and destruction by Mongol marauders in the case of the Ellora Caves and Muslim invaders in the case of the churches at Lalibela. 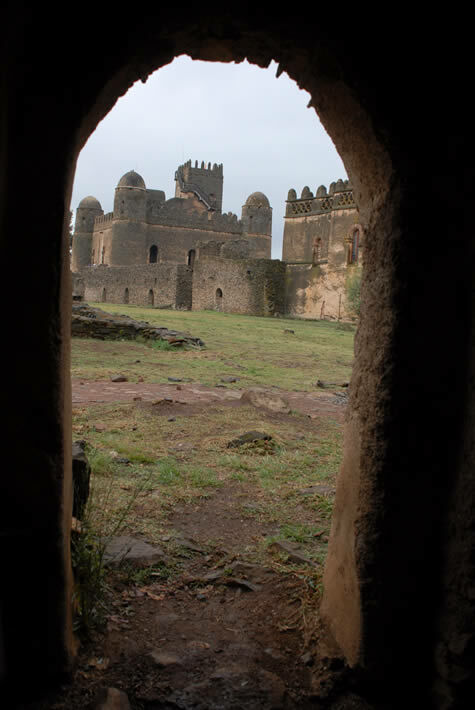 Tomorrow the Castles of Gondar, inspiration perhaps for J.R. Tolkien's famous walled city in the 'Lord of the Rings'? Many thanks in the meantime to the Sheltons of Northmoor, UK, who have brought the totally needed to ship Moksha back to Europe with a very generous donation of $500. Not being a good twiddler of thumbs I decided last Sunday to resume progress from Dessie to Gonder, even if it meant spending a few days on a bus to backtrack for the visa. 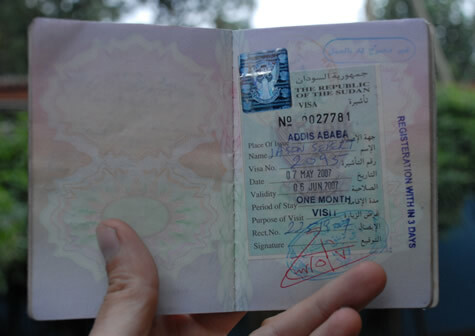 There's always the chance that the visa won't be approved even by the time I reach Gonder! So it made sense to push on regardless of the whims of Sudanese bureaucracy. I'm now about half way to Gonder taking a rest day in the small town of Debre Tabor, once an important Ethiopian capital in the 18th and 19th centuries, now little more than a transport hub between regional towns. The roads since Dessie, although exceptionally rough, have afforded me a pretty good glimpse of the legendary Ethiopian Highlands. 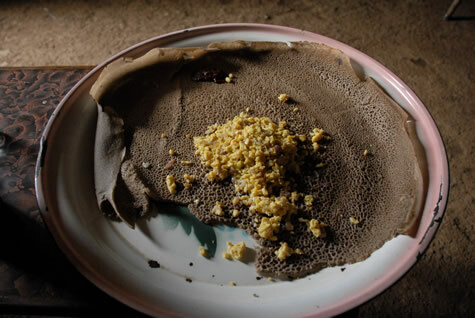 Having read up on the wonderful history of the region, epitomized perhaps by the the powerful Aksum Kingdom that rose in the 1st century AD to control a vast area stretching east across the Red Sea into large parts of Southern Arabia and west into the Sudanese Nile Valley, my expectations were high. However I am sorry to say that I am so far quite disappointed, both in the environment and the people. The land looks completely exhausted: all the trees have been cut down (they used to cover 40% of the landscape, now just 3%); any communal land is severely overgrazed and every square inch of soil, even on the sheer hillsides, has been ploughed for growing cereal crops including the indigenous 'tef' that the people use to make the bitter-tasting 'injera' bread (looking rather like a dirty nappy). The result is massive soil loss through erosion to the point where only rocks seem to thrive. Last night I had dinner with 'Dr. Richard', a German Agronomist/land management specialist working through German government funding to implement erosion control measures in the region. I got the distinct impression after we polished off several beers and a bottle of decent tasting Italian wine (he's the only westerner working here, so I think he was glad of the company) that he felt the program's efforts were fatally flawed for a number of reasons: the short timeframe that his superiors would expect results (a three or four year plan was not enough to see real progress, more like several decades of commitment), and more importantly the exponential birth rate (5%) leading to huge population pressure on the land and the extreme poverty of the local farmers leaving them no choice but to continue cutting the trees and tilling every inch of ground, even though they know it's not the right thing to do in the long run. While most (but not all!) of the adults I've met are congenial and friendly, the children are for the most part completely vile, making the Tibetan stone throwers I encountered last year seem like angels. At the first sight of my bike they abandon their herds of sheep and goats grazing beside the road and run screaming and yelling to intercept me. If I'm on a flat stretch or going downhill I can get ahead of them before the stone-throwing starts. But if I'm going uphill I'm a sitting duck: they quickly catch up, bombarding me at first with the machine-gun staccato 'YouYouYouYouYou', which although is apparently meant to be a harmless way of getting one's attention, is usually delivered with such aggression and persistence that it quickly chews one's brains to bits. Then comes the begging: for money, pens (they have a bizarre obsession about acquiring pens here) or my Highland brand water bottles ('Highland-Highland-Give-Give-Give'). I experienced roadside begging in other countries of course, but nothing like this. When they see me coming with all my gear they must think it's Santa Claus riding over the horizon, pannier bags full of Christmas goodies that have to be dispersed as quickly as little hands will carry them away. And while I understand the underlying reason for this - decades of handouts by foreign NGO's and aid organizations (not to mention Sir Bob's 'Live Aid') to alleviate the war and famine that the country has traditionally suffered from - it's very sad to see the pride, self-reliance and dignity that I see in the faces of the older generations undermined so completely by the attitude of the young. The usual result of such encounters, where I have to say no to almost every request, is stone-throwing. If I had a dollar for every stone that's been thrown at me over the past four days I'd have enough to fund another circumnavigation going the other way around! I hated having to do it but I've resorted to wearing the 'khukri' knife on my waist again, something I only do when traveling through areas where robbery is a possibility. While the road I'm on is definitely dangerous at night with 'shifta' (bandits) setting up roadblocks to rob travelers at gunpoint, the main reason for packing steel again is to frighten off the kids in daylight hours. It really is the only thing that seems to work. If I shout at them it only makes them more crazy. If I throw stones back it eggs them on even more, and if I were to hit any of them then I'd probably be thrown in a local jail and have some opportunistic local police try and extort a ludicrous sum of money from me as 'compensation' (none of which would ever reach the victim of course). But if I rest my hand on the handle of the Nepalese knife, which looks more menacing that it really is (in my hands at least), they flee with satisfying consistency. It's probably hard for you to reconcile these words with this photo of angelic looking children or the vlog. Bear in mind however they were being bribed for the photo with a packet of biscuits. 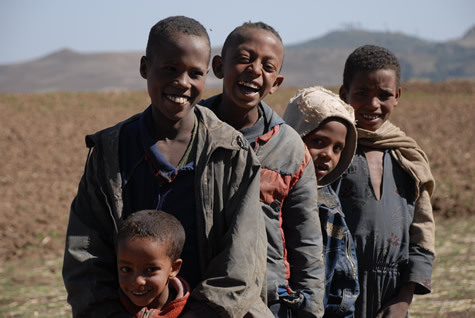 Most Ethiopians HATE cameras and nine times out of ten refuse to be filmed either with a still camera or a video camcorder. Hence the rather short video clip for this update. On a more positive note the first two days out from Dessie, in which I cut across country to take in the mountain top fortress of Maqedala where the Emperor Tewodros took his last stand against the British in 1867, allowed some spectacular scenery with few people problems. 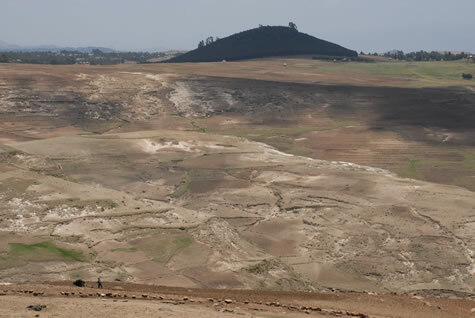 As I learnt from the harsh topography - the road descending and ascending over six vertical kilometres in just 100 horizontal kilometres - Tewodros had chosen his defensive position well. The Brits however, enraged by the imprisonment of several of their functionaries present at his court, brought a well equipped army of 32,000 from England and stormed the fortress. 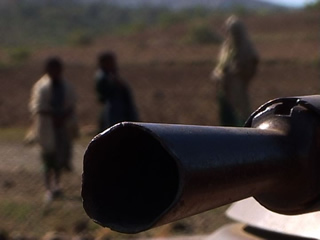 Unwilling to make terms Tewodros's army was wiped out and he himself committed suicide; a tragic end to a petty dispute that seriously weakened Ethiopia's image in the international community, especially with other colonial powers hungry for expansion. 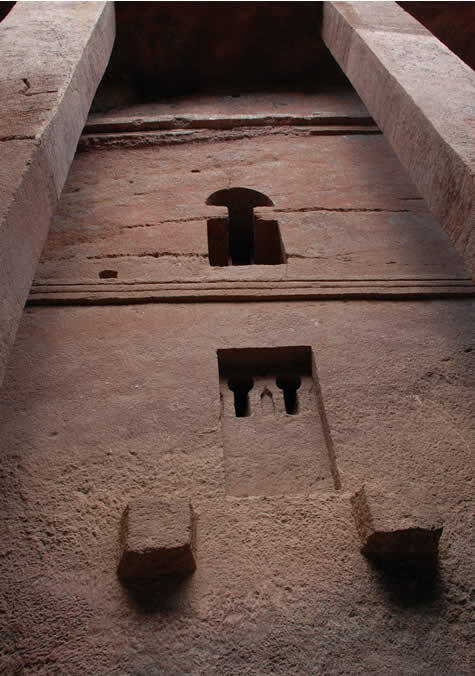 In a couple of days I'll be posting a follow-on update on one of the most important historic sites not only on the African continent, but in the Christian world: the rock-hewn churches of Lalibela.